PvP League Season 13 begins on August 28! Duo queue returns for all ranks, and the leaderboard titles will be retired. The release will also include a skills and balance update. You can discuss Season 13 in this thread on the official forums, and read on for more information on changes to the revenant’s herald elite specialization from the Systems Team. If you have questions for the team, head over to the official Guild Wars 2 forums and take part in the latest ArenaNet Forum Chat. Revenants were introduced with Guild Wars 2: Heart of Thorns™ to aid in the skirmishes and battles against the Elder Dragon Mordremoth. They brought their ability to invoke the power of the legendary dragon Glint to the fray. With the next balance update, we’re making a bunch of changes to the specialization line to bring herald up to date; Glint undoubtedly foresaw this. First, each of the existing facet skills has had its corresponding active skill labeled as a consume skill. This is to help differentiate the two, and it allows for a bit more variation in some traits. While Glint may have bided her time in the distant past, we wanted to push more impactful gameplay to this specialization and began with the F2 ability, Facet of Nature. Previously, this facet would grant nearby allies an increase to their outgoing boon durations. Soon it will instead grant allies prowess based on the legend that you invoke! For example, embodying King Jalis Ironhammer will reduce the damage each of your allies receive. If you’re channeling the vicious nature of Shiro Tagachi, allies around you will steal health from enemies they strike. Should you decide to invoke a different legend while the Facet of Nature is active, the boost you grant to your allies will change with you, allowing you to adjust on the fly. Furthermore, the consume skill True Nature also changes with the legend you are channeling. Each legend’s True Nature skill sticks with their theme, but does so in a different fashion from the facet. Using the True Nature of the legendary dwarf will grant each of your nearby allies several stacks of stability—maintaining defense, but against crowd control instead of damage. For the legendary assassin, the F2 skill will strip nearby enemies of their boons, maintaining his offensive and aggressive style. Unifying a group of champions. Channeling her gift of prophecy. Lending magical aid to allies with healing and boons. Focusing on the facets of Glint and enhancing those powers of hers. Turning inward and channeling potency to yourself. Elevated Compassion: Heal other allies when you grant them a boon. Helping allies in a two-for-one manner by granting health while powering them up. Core Value: Improve the active effects of your True Nature (F2) ability. This trait strengthens the effect of your F2 consume skill, making your choice of which legend to channel when activating this skill more meaningful. For example, using True Nature as Shiro with Core Value active strips a greater number of boons from nearby enemies. Hardening Persistence: Gain damage reduction based on your active energy upkeep, and your shield abilities now remove conditions. This trait was previously in the adept tier and is now a master-tier option. Its toughness has been replaced with a percentile damage reduction, and it now improves your shield abilities so that they remove conditions from affected allies. 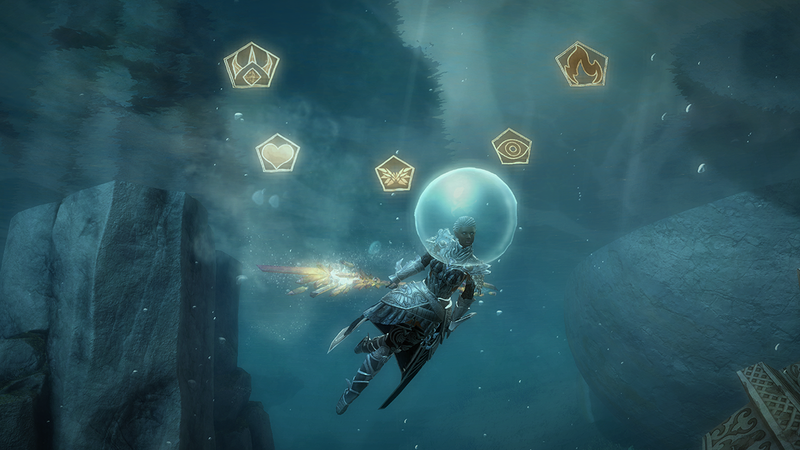 Also, you can now channel Glint underwater.